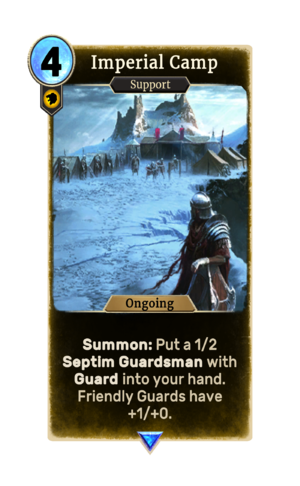 Summon: Put a 1/2 Septim Guardsman with Guard into your hand. Imperial Camp is a rare Willpower support card. It is part of the Heroes of Skyrim expansion. In addition to the card's availability in the Heroes of Skyrim expansion, two copies are included in the Alduin's Apocalypse theme deck.